Need help setting a shareholder-employee salary in an S corporation? 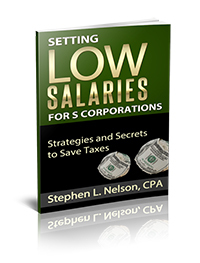 This ebook, by CPA and tax professor Stephen L. Nelson, explains who you set effective, reasonable salary levels that potentially save a business thousands in taxes annually. Need to set a salary for an S corporation shareholder-employee? This 40pp e-book from S corporation expert and best-selling author Stephen L. Nelson gives you all the tips, tricks and tactics for doing just that. Note that Nelson was an adjunct tax professor at Golden Gate University's graduate tax school and taught the capstone course on S corporation tax law to CPAs and attorneys in the masters in tax program. Nelson is also the author of QuickBooks for Dummies. Nelson practices accounting in Seattle, Washington and serves over a hundred small business corporations.